The Search industry changes announced by Google over the last few days are quite big. They will affect just about everyone. This isn’t just a matter of a change to an algorithm or new ad format, this is a wholesale change of strategy that has been tested and rolled out across all languages and countries. 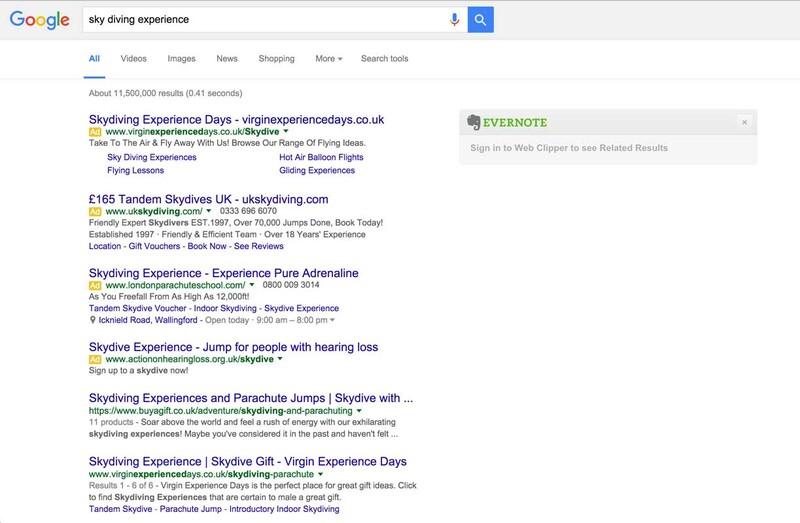 What you used to see when you made a Google search for a keyword was a list of optimised results on the left hand side and a series of ads on the right hand side. Ads that gained higher quality and performance scores were then promoted to the top of the left hand side as a reward for being good ads. If you look at search results now everything has changed. Another instance is the Knowledge Panel, although this is a hotly contested piece of information with claims and counter claims that ads do and don’t appear. 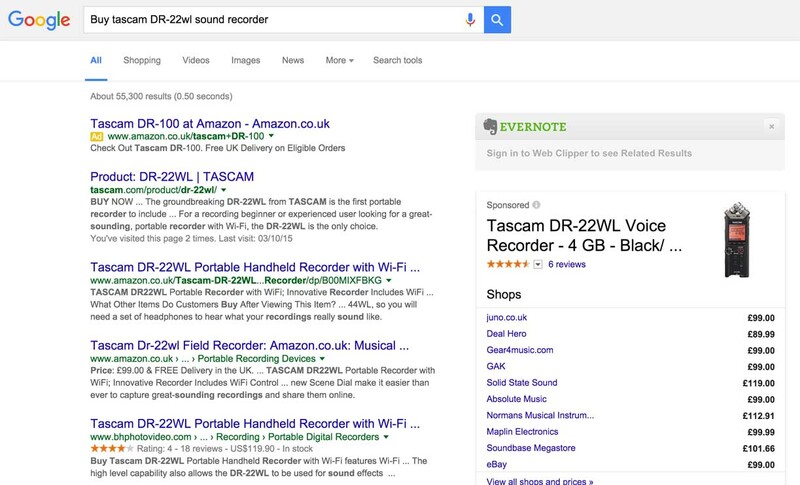 The official word from Google is that Ads do appear on the right hand side for Knowledge Panel. We tested this out for a series of searches and found no evidence of text ads appearing on the right hand side for Knowledge panel. What we did see was Rich snippet product ads from Google Shopping. 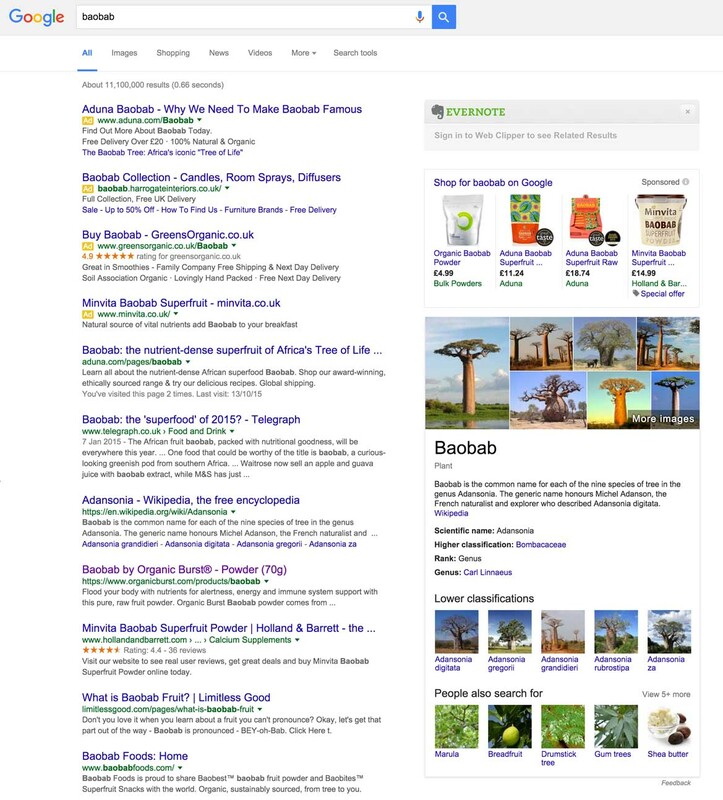 We also saw a reduced number of ads on the left above natural search listings. Maybe this is intended as a new ad offer or just something that is still being refined. Our job isn’t really to guess what Google is going to announce. Our job is to write, present and optimise content in the best way possible for our clients. This means picking the right online marketing technique for individual circumstances. Based on that, we already have a strategy to deal with it. We, and many others, have looked at these search industry changes, and it is clear that Google are reacting to mobile devices. Not all websites see the shift from desktop and laptop to tablet and mobile, but a majority does. The small screen is now the dominant platform to experience the web. It maybe unfair to lump in a full sized iPad with a smaller screen iPhone but that is what has happened and the balance has moved towards iOS and Android rather than Windows desktop and OSX. This strategic move takes that factor into account but also looks at the way people are using different devices for the web. Mobile users continue to see 3 ads at the top of the search results. That much hasn’t changed. People use their phone’s browser to research and find out information, but it does look as if the actual purchase decision is made either from a desktop or from a specific retailer mobile app. This may be to do with time and place, where people are uncomfortable putting in credit card details when they are not sat at a desk. There is also the idea of storing payment details with a supplier through an app rather than through the website and this would appear to be the trusted method of payment by users. Certainly mobile browsers do not look to be the trusted method of payment yet. This accounts for the changes and exceptions. It is something to keep in mind when planning SEO and PPC strategies for all devices. It is also something we take an in depth look at with our clients. For standard browsing, mobiles and tablets are used more and more, and so the right hand side ads were not going to be seen anyway. Google are making a preemptive strike against PPC ads not being as effective as they once were because fewer people were seeing them. It does mean that fewer ads are going to show on each page. Google have announced that in hotly contested searches that they are going to ad a fourth ad above the natural search results. We tried this and found it hard to find an example that didn’t have the fourth ad. In fact the only searches we could find that didn’t were the ones that included rich snippet ads from Google Shopping that presented the user with 5 picture snippet ads. We therefore think that certainly for now, 4 ads at the top of the search listings is the new norm. What hasn’t changed is the selection of those ads with high quality scores and click through effectiveness being more important than high bidding. By reducing the number of ads, Google has made it more difficult to place your ad prominently in front of prospects. There are now 4 at the top and 4 at the bottom but we all know that the ads at the bottom are going to get little or no attention. It is therefore more important than ever for your Pay Per Click Advertising to be run by professionals who know what they are doing. Fewer companies will be able to place effective advertising through Google, but those that do will see higher volumes. Google is therefore looking to make more money from fewer advertisers but to concentrate on quality from them. It is a bold move but will hopefully remove a lot of the PPC charlatans that are out there. At Be Different we achieve high quality scores and very effective click through rates on the campaigns that we run. This is because we make sure that we are on top of all the changes that Google make, just like this one. With the number of ads appearing above natural search listings it does mean that those 4 ads will get more attention. It also means that more companies will find that SEO becomes much more important to them. How many industries can you think of where there are only 4 major players? People talk about the big 6 energy companies. Once the top 4 ad positions are taken up, what happens to the other 2 who want to advertise? On Google now, SEO has just become a lifeline that cannot be ignored, not if you want traffic to your site. There are many organisations out there offering incomplete SEO services that promise much and deliver little. This is because they do not appreciate all the different facets that affect SEO. Our strategy has always been to start with the question of what is going to create the right traffic, and then to use our in depth research platform to create a plan that we can execute and achieve high rankings so that the right person sees the right result at the right time. When that happens click through goes through the roof. We are very proud of our SEO performance and so are our clients. These changes make that success even more important. If you would like to discuss this article or ask us about how the search industry changes affect you then please get in touch.